The descriptor Kelvin is often used as a measure of color temperature of light sources. Color temperature is based upon the principle that a black body radiator emits light the color generated at the temperature of the radiator. Black bodies with temperatures below about 4000 K appear reddish whereas those above about 7500 K appear bluish. Color temperature is important in the fields of image projection and photography where a color temperature of approximately 5600K is required to match daylight film emulsions, thus producing true colors. It is interesting to note that Kelvin is in direct opposite of nanometers as far as color is concerned. A 20,000K lamp appears violet/blue whereas a lamp that peaks at 425 nanometers (on a scale of 400-700 nm) would be very close to a 20,000K lamp which is also violet/blue in appearance. Nanometer wavelengths differ from Kelvin as the nanometer is the term used to measure the visible light of electromagnetic radiation and not color temperature. Visible light is electromagnetic radiation that is visible to the human eye and is responsible for our sense of sight. Visible light has wavelength in a range from about 380 nanometers to about 740 nanometers. The visible light range is located between the invisible infrared which is found at longer wavelengths, and the invisible ultraviolet which is found at shorter wavelengths. For our purposes we are interested in the visible light which falls between 400 to 700nm. This is the spectrum that PAR meters are generally calibrated to as well as the spectrum which aquarium lighting falls into. For freshwater plant growth, Orphek LED technology has proven that 14K white, plus red and blue LEDs of the correct wavelength are considered to be the best as they emit peaks in the chlorophyll A and B range which is very beneficial for plant growth. The 14K lamps also provide excellent growth for SPS and LPS corals. Supplemental actinic (420-480 nm) are often used with these lamps to provide a more pleasing appearance of the corals and fish and to fill in this needed spectrum. Saltwater absorbs slightly more light energy than freshwater due to the higher density (specific gravity) of the water and in this regard, 6500K normal output fluorescent lamps are not a good choice for SPS and LPS corals kept more than twelve inches from the surface. The 9,000 to 10,000K lamps generally produce very good growth rate for soft and LPS corals but slows down growth of SPS corals. The 14,000K lamps which are popular with metal halide and LED lighting will penetrate the water better than the above lamps and still provide a good PAR level for all corals including SPS. This lamp choice is recommended for tanks 15 to 30 inches in depth providing the intensity is there to achieve a good PAR level. The 20,000K lamps are noticeably bluer than the 14,000K lamps and will bring out all of the fluorescent pigments found in many corals. The drawback is that when used alone, SPS growth will be slowed or even stop completely. For this reason, these lamps should not be used as the only lamp in reef tanks if one wishes to keep SPS corals. This is why 18,000K lighting that can provide the spectral range (PUR) needed by corals is most desirable. Fortunately, these are available in the form of LED lighting fixtures but not available from every company that produces LED light fixtures. Do not confuse the color a lamp or LED emits with a particular nanometer range as light in several nanometer ranges can be used to develop a specific Kelvin temperature lamp, much the same as 1+3 and 2+2 both equal 4. Many manufacturers will do this to provide the necessary wavelengths needed for coral growth while still maintaining the desired color temperature. Lux is a measure of the intensity of light, one Lux is equal to one lumen per square meter. One must keep in mind that a Lux reading only measures light intensity to which the human eye is most sensitive (green) and a Lux meter will not measure wavelengths over 580 nm. This can still be a useful measurement for freshwater plants and some corals in reef aquaria. Some studies have shown that the minimum light intensity should be no less than 3,000 Lux at the deepest part of the aquarium. I personally feel it should me much higher than that and somewhere around 15,000 Lux. Lux on a tropical reef has been measured to be between 110,000 and 120,000 at the surface and 20,000 to 25,000 one meter below the surface. The difference between Lumens and Lux is that the Lux takes into account the area over which the luminosity is spread and for our purpose, is a more desirable rating than lumens. A flux of 1000 lumens concentrated into an area of one square meter lights up that square meter with a luminance of 1000 lux. If the same 1000 lumens were spread out over ten square meters it would produce a dimmer luminance of only 100 Lux. A lux reading on inexpensive lux meters available for the aquarium hobby can be converted to Lumens by use of this formula. PAR is the abbreviation for Photosynthetically Active Radiation in the spectral range of 400 to 700 nanometers. This is the range that is needed by plants and symbiotic Zooxanthellae algae which live in the tissues of corals, anemones, clams, and other photosynthetic life. Without the presence of Zooxanthellae these animals would die as they produce 90% of the food requirements these animals require. Most photosynthetic life do not utilize the full spectral range that PAR covers but respond best to light in the PUR (Photosynthetically Usable Radiation) range. 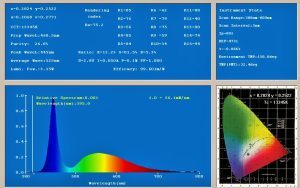 This can be confusing to many as there are light fixtures and lamps that are advertised as high PAR systems but do not provide a spectrograph to see the spectral range at which the PAR level was derived at. Photosynthetic invertebrates respond best to light that falls into wavelengths between 400-550 nm and 620-740 nm which is the PUR range. A PAR reading of 300 and higher isn’t as good as it appears if this reading is derived from wavelengths produced throughout the entire PAR spectral range (400-700 nm) as much of this energy is not needed by photosynthetic animals and is wasted energy. This is one reason why it is very important to view a spectrograph of a lamp or LED fixture before purchasing. This will allow you to view the wavelengths of which a PAR meter will actually measure. A PAR reading of 150 at the deepest part of a tank will promote growth of all but the most light loving corals provided the lamp or LED falls into PUR range stated above. “my new LED light isn’t as bright as my old metal halide light”. LED fixtures tuned to the PUR wavelength use wavelengths of light that are the least sensitive to our eyes in terms of brightness even though these wavelengths are intense to corals and other photosynthetic life. This is a good example of why you do not want to look directly at a UV germicidal lamp. It does not appear bright to your eyes because of the wavelength, but the damaging rays are very intense and can have a negative impact on your vision.